Apparently they were stashed on the second floor in a secluded back room to dine with some of their friends. Alicia Keys' New Vid For "Like You'll Never See Me Again"+Chingy Used To Date Ciara & Trina? Alicia and Common did a fabulous job in this vid. Loves it. 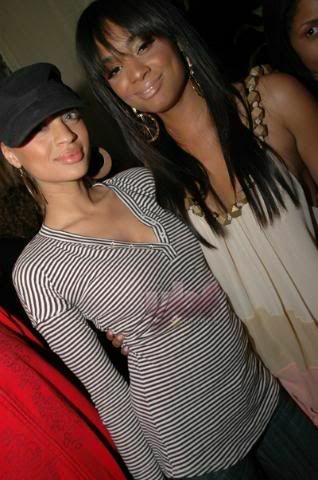 BET's Alesha Renee's b-day party went down at Manor in the NYC this weekend: Egypt and Nik came out to kick it. Her new look is fab. 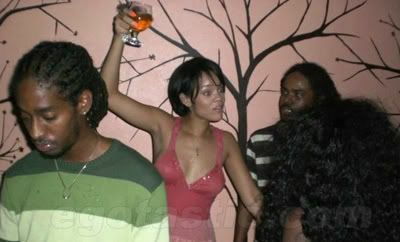 Rihanna's Got Her Drink And Her 2 Step?+Lil Kim Does The Game +J-Hud, Mya, & Kelly Rowland Are "Out"
And seeing that you have about 2 years till you can legally down some Patron or Henn or anything here in the US Rihanna...I hope these pics were taken back in Barbados. Having a black Britney Spears/La Lohan on our hands is unacceptable. Ummm Garcelle, Kim Porter, Amerie, & ABC...Seriously? I'm fully convinced that Garcelle Beauvais' full time job is hitting the red carpet and delivering those twins was just her vacay. Why? : Because chick hit the launch party for Dussault Apparel's concept store on Melrose Avenue yesterday...less than a month after delivering two babies. I don't know whether to bow down or wonder what's really the deal here. Shaunie is ready to get at Shaq about his secret ish now. She filed papers yesterday demanding to see all of Shaq's assets and to get a closer analyzation of his $100 mil contract with the Heat. It doesn't state why but I'm sure all the allegations and check-ups he's putting out there about her these days has something to do with it. YBF exclusively reported weeks ago about Shaunie biting her lip in response to Shaq's very public lies about her. But it looks like she's ready to fight back. YBF also reported a couple weeks ago that Shaq was selling the Miami mansion to A-Rod from under her and the kids . And in Tuesday's edition of the Daily Business Review--the interest in selling to A-Rod was confirmed. J-Lo and Marc Announce Pregnancy+Jim Jones & Juelz Santana Act A Fool+Tyra's Got A New Man? Jenny and her hubby waited till they got to the MIA to announce the worst kept secret in Hollywood-her pregnancy. When they took the stage during their concert tour last night, J-Lo busted out with "Marc and I are expecting a baby!" to a crowd going nuts. And Marc rubbed her belly while both talked about how happy they are. An official congrats to the happy couple. In other news...Tupac was shot.